If you would prefer to register and pay off-line, please call (206) 842-4475 x216 or come into BARN. BARN Cancellation and Refund Policy: To change or cancel your registration, please call (206) 842-4475 or email info@BainbridgeBARN.org at least four (4) days prior to the class/event start date in order to receive a refund. 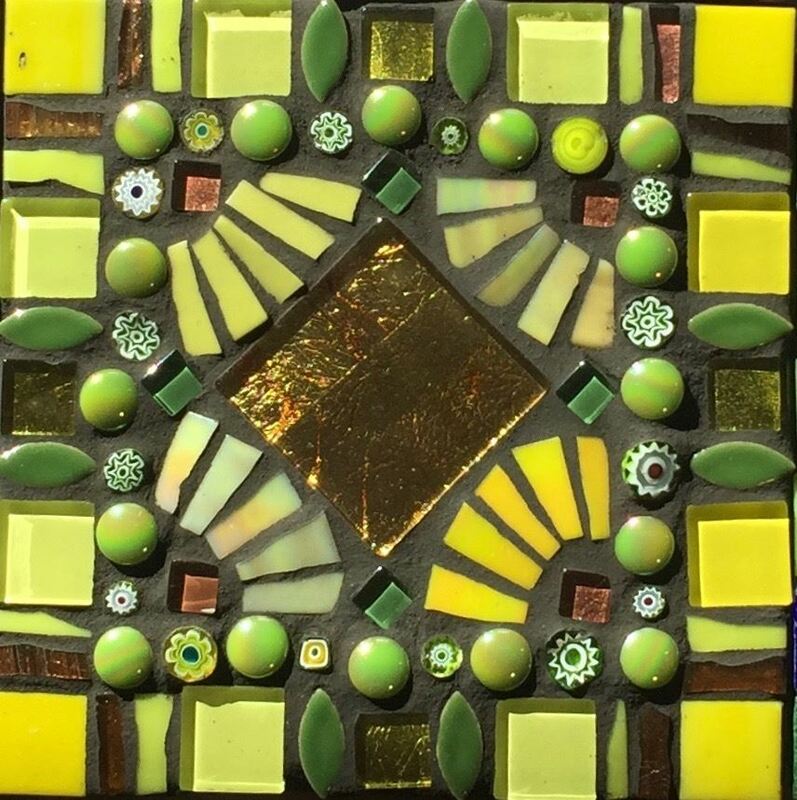 This 2 session beginning mosaic class covers the different types of materials used to create mosaics as well as adhesives, bases, and grouting. You will learn to use the tools, select the materials, and where to purchase what is needed to create a mosaic. Creating a simple trivet out of glass tiles, stained glass and gems allow students to focus on learning basic mosaic techniques. The project will teach skills such as cutting stained glass and tile, different approaches to applying materials, and selecting grout. On day 1, we design the mosaic and adhere the design to the base, and on day 2 we grout and complete the project. At the end of the class you will have the knowledge to create simple mosaic projects on your own as well as a mosaic trivet. There is a materials fee of $35 which is included in the cost of the class. Remember close-toed shoes and long pants in the Glass Studio at all times. This is a strictly enforced safety policy. Bring an apron as this can be a messy medium! Instructor: Gillian Allard first fell in love with mosaics in Barcelona’s Park Güell after seeing the work of Anton Gaudi. Her first art pieces were stepping stones. She then progressed to furniture and signs. Most of her work is inspired by discarded or broken dishes that become one-of-a-kind functional pieces for the garden and home. In addition to china, pottery and stoneware, a variety of glass tile and gems, broken tile and found objects are incorporated into her designs. The breaking of the ceramics is organic and random in nature and one of her goals is to capture that energy. Recreating memories reusing materials are an important part of her mosaic work. When someone gives me a broken dish and I can give it back to them recreated and ready to function again, I have united the best elements of this art form.